What makes the best brownie? I like mine more fudgy than cakey. I like rich chocolate flavor and zero nuts involved. I like something that feels decadent but isn't cloyingly sweet, or gut-achingly rich. I even have to admit that I like a brownie that feels almost like it came out of a box, with that crisped layer on top and soft interior. 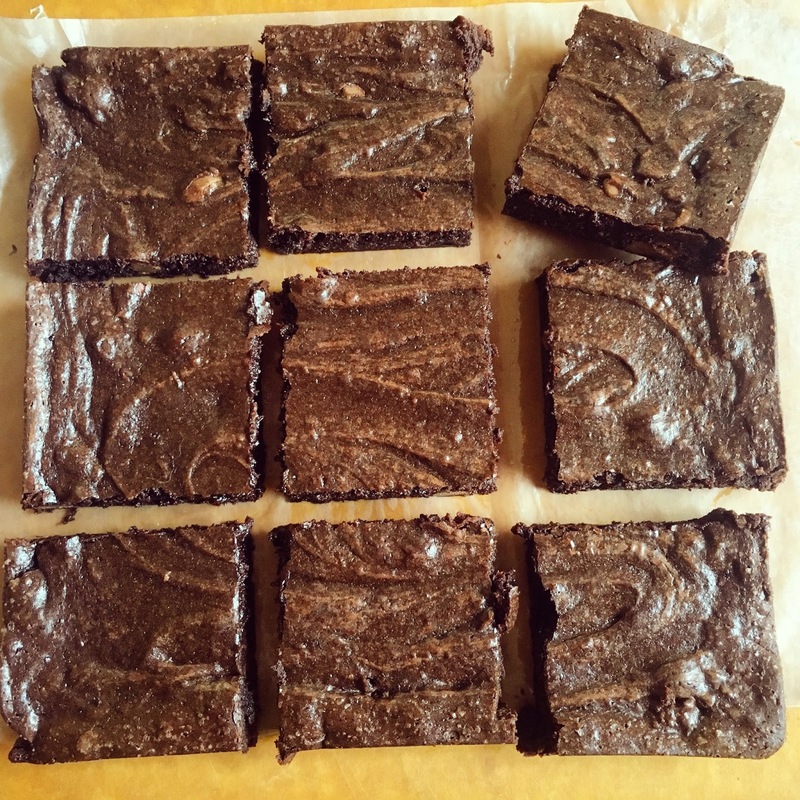 In my personal brownie baking quest this recipe is easily my new favorite. It relies on cocoa powder for the base, and while I was skeptical about what that would do to the taste, I found that I like it even better than fussier versions that use tempered chocolate. Web searches for "best brownie recipes" led to this recipe by Alice Medrich found on Food 52. Its virtues have been tested and confirmed by countless others. The changes I made are minor: I added espresso powder to the mix (brings out the chocolate flavor), and I added chocolate chips to the batter (I like a secondary note and texture of real chocolate combined with the cocoa powder). I omitted pecans, because of the aforementioned preference. Otherwise, I stayed true to Medrich's method; including beating the batter 40 times with a wooden spoon. My only criticism is that the brownies could be thicker. I wonder how a teaspoon of baking soda or doubling the amounts and baking this in a 9" x 13" pan would affect the outcome. Other than that, these are perfect. Easy to make. They're the "best." Grease an 8”x8” baking dish. Line with parchment so that the parchment hangs over 2 sides (will make it easy to lift out the brownies). Cube the butter. To a medium heatproof bowl add the butter, sugar, cocoa powder, espresso and salt. Place the bowl on a wide pot or skillet with simmering water. Stir until the butter has fully melted, the cocoa is just hot to the touch, and the mixture forms a paste. If the butter is not melting, adjust the heat accordingly. Using a wooden spoon, stir in vanilla. Then, add the eggs one at a time; stir vigorously each time you add the egg and ensure it is fully incorporated and the batter is shiny. With a wooden spoon, stir in the flour until it just disappears, then beat vigorously 40 times (this is a critical step that aids in the great chewy texture of the brownie). Stir in the chocolate chips, if using. Bake for 20-25 minutes, or until a toothpick comes out mostly clean. Let cool on a rack. 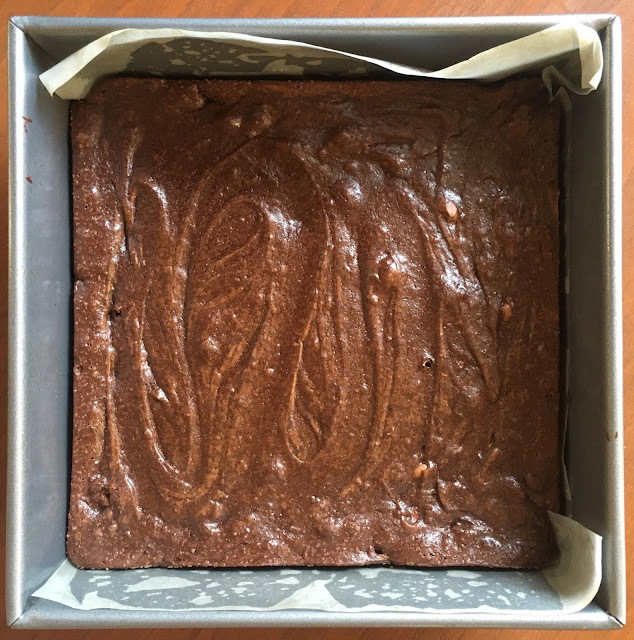 Once cool, transfer the brownies out of the pan and cut into the desired amount of squares (9,16, or 25).